An angry elephant threw a 63-year-old Swiss tourist to the ground and trampled her to death during an eco-tour in Thailand. Four other tourists were also injured. The incident happened during a jungle trek in Khao Sok National Park about 100 miles from the resort of Phuket. Two elephants carrying the Swiss women and the other tourists crossed paths in the jungle and began fighting, officials say. "It happened because the elephants quarreled with each other. One lifted its feet so the tourists fell on the ground and it stamped on her," Lieutenant Colonel Apidej Chuaykuar, the police officer in charge of the case, tells AFP. The Swiss foreign ministry confirmed the Swiss woman's "tragic death." A British woman was also reportedly in serious condition with 12 broken ribs at a Phuket hospital. The other injuries were believed to be minor. 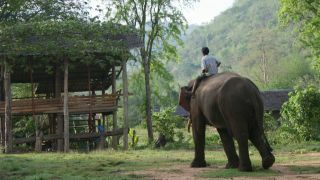 Elephant rides are a popular activity for tourists visiting Thailand.